Meet Anthropology Ph.D. student Rachel Burger an learn about her archaeology work right here on SMU’s campus. 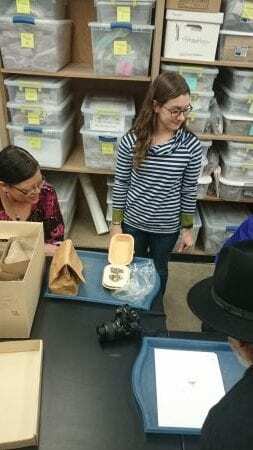 As part of the Ph.D. program in Archaeology here at SMU, I have had the opportunity to work as the Collections Management Research Assistant in the Archaeology Repository of Collections (ARC) for several semesters. For decades, SMU Archaeology faculty and graduate students conducted research in Texas and neighboring regions, resulting in over 3,100 cubic feet of artifacts and associated archival documents now curated within the Anthropology Department. I supervise a group of undergraduate students and guide our day-to-day activities in the repository. Most of our activities focus on the proper care and rehabilitation of the collections. This entails upgrading the storage of some of our older collections, conducting detailed inventories, and combing through the archives for information on past archaeological projects and the history of the repository itself. I have also participated in consultations with affiliated Native American tribes, facilitated the use of the collections for education and research by SMU faculty, students, and visiting researchers, and am currently helping to plan for the future of the ARC and the collections under its care. Through these projects, I have also had the opportunity to mentor and work one-on-one with undergraduate students that are just beginning their careers in archaeology. Working in the ARC not only provides me with practical experience in the field of archaeology as I progress through the Ph.D. program here at SMU, but it is also an incredibly fulfilling experience. As archaeologists, we have an ethical responsibility to properly care for the artifacts resulting from our research, to ensure that they are accessible to other scholars, and to promote collections-based research within the field. The work I am doing now will help to secure these collections for the future so that others may benefit from them as I have.